Kitsune-soba are hot soba noodle with salty-sweet fried tofu added on top. In Osaka, it is called Tanuki which most commonly means raccoon dog in Japanese. 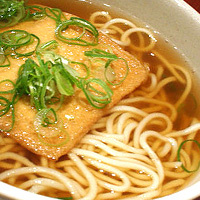 Adding fried tofu makes it high in protein than regular soba noodles. However, beware it is also higher in carbs which may not help you cut back on calories in your diet. The calories in Kitsune-soba per 428g(1 cup) is 441 calories. Kitsune-soba is calculated to be 103Cal per 100 grams making 80Cal equivalent to 77.67g with 62.79g of mostly carbohydrates、20.93g of protein、11.47g of fat in 428g while being rich in vitamins and minerals such as Sodium and Magnesium.